A strong earthquake in mountainous central Italy kills at least 38 people. 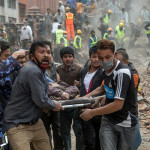 The quake causes serious damage to a number of towns and villages, but did not seem to have hit heavily populated areas. An earthquake measuring 5.7 on the richter scale strikes off the coast of Queensland about 110km east of Fraser Island at 1.38pm. Following this, there is another quake of 5.2 magnitude at 2.46pm in the same area as the first earthquake and then finally an aftershock measuring 3 at 4.30pm. There is no tsunami alert and there is no damage to property or life. The tremor is felt from Bundaberg to the Gold Coast. It is the strongest quake to hit Queensland since 1918. Developing a reliable approach that can separate potential earthquake-induced electromagnetic pulses from the myriad of natural and anthropogenic sources has been a significant challenge. We look forward to seeing the innovative ideas from this competition and learning more about this controversial phenomenon. A earthquake of 4.3 magnitude strikes in Fontana,California. The quake was felt over a wide area of the Inland Empire and eastern Los Angeles County. In the past 10 days, there has been one earthquake of magnitude 3.0 or greater centered nearby. Schools in Nepal re-open after approximately ninety percent of nepalese schools were destroyed. Many schools are built out of temporary materials such as bamboo and tarpaulin, and are to be replaced with new, permanent buildings within the next two years. The United Nations sends educational relief packages with the intent of assisting students psychologically after the earthquake. School days are being shortened and focusing more on cultural activities in order to further assist with the aim of helping children recover from this disastrous earthquake. The children are very happy here to engage themselves with different kinds of playing materials, recreational materials. Scientists predict that a series of earthquakes and shifting ground on the slopes of Kilauea may cause eruption of one of the world’s most active volcanoes. A lake of lava near the summit of Kilauea on Hawaii’s Big Island has risen to a record-high level after a recent explosion. 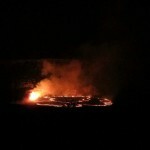 The pool of molten rock begins sinking, and the surface of the lava lake falls nearly 500 feet. Meanwhile, a rash of earthquakes rattle the volcano with as many as 20 to 25 quakes per hour, and scientists’ tilt meters detected that the ground is deforming. Clearly the lava, by dropping out of sight, it has to be going somewhere. Snowfall, torrential slides and avalanches are suspended in three remote areas of Nepal after avalanches. Nepal Army’s salvage group had taken out 120 bodies, including those of nine foreigners, from the range. However, the status of 180 others is not known. getting help to some of the worst affected areas is a major challenge. Massive tremors have been felt here in Delhi and several other parts of India. You can see pictures of our Delhi studios, where the windows rattled and everything shook for a very long time, for a minute perhaps or longer. We don’t know about the casualties, we are flooded with calls. There is no power and families are listening to the FM radio inside their cars. News of multiple building collapses. I’ve seen many cracked walls and roads and buildings. The (Dharahara, a landmark tower in Kathmandu) was packed with people a while ago. There are police everywhere trying to move rubble to make space on the roads for ambulances. Everyone is very scared.
. . . [a] destructive Pacific-wide tsunami was not expected. A strong earthquake shakes central Japan’s Nagano region injuring several people and collapsing a building in area village, the country’s Kyodo News Agency reports, citing firefighters. Reports of the intensity of the quake, centered in the Nagano area at 10:08 p.m., differ. The Japan Meteorological Agency reports it is a 6.8 magnitude temblor; the U.S. Geological Survey says it is magnitude 6.2. A 3.4-magnitude earthquake rumbles through northern California early in the morning. According to the U.S. Geological Survey, the epicenter is five miles from American Canyon, seven miles from Sonoma and 50 miles from Sacramento. The temblor occurs at 1:56 a.m. Pacific time at a depth of 6.2 miles. There are no reports of damage so far, the Napa County Sheriff’s Office said. A 6.0-magnitude earthquake strikes Northern California according to the U.S. Geological Survey. One “young child,” a girl, is in critical condition, Napa Division Fire Chief John Callanan says at a news conference. She is hurt when a fireplace collapses. It is the strongest earthquake to hit the Bay Area since 1989, when a quake struck during the World Series. A 6.8 magnitude earthquake struck off the coast of Japan early Saturday morning. The quake was centered off of Honshu island and was 7 miles deep. A tsunami warning was issued but later changed to an advisory. Mexico’s Chiapas state is suffering from a 6.9 earthquake. A man living in the town of Huixtla is the only casualty. Shaking from the earthquake can be felt in nearby Guatemala. A 5.5 magnitude earthquake hits in South Africa with its epicenter close to Johannesburg, South Africa. One person is reported to have died. The quake was felt as far a field as Durban, Zimbabwe and Swaziland. A massive earthquake of magnitude 8.2 strikes off the coast of northern Chile, triggering a tsunami, according to the U.S. Geological Survey (USGS). A tsunami warning is in effect for the coasts of Chile, Peru and Ecuador; waves nearly 7 feet (2.1 meters) high are reported in Iquique, according to the PTWC notice. A tsunami watch is issued for Colombia, Panama, Costa Rica, Nicaragua and El Salvador. There is also a tsunami advisory in place for Hawaii, where swimmers and boaters are warned that they could see bigger waves than usual. A colossal earthquake begins to shake the northern part of Sumatra and the Andaman Sea to its north. Seven minutes later a stretch of the Indonesian subduction zone 1200 kilometers long had slipped by an average distance of 15 meters. A large tsunami triggered by the earthquake spread outward from off the Sumatran coast. The worst part of it washed away whole cities in Indonesia, but every country on the shore of the Indian Ocean was also affected. In Indonesia, some 240,000 people died from the quake and tsunami combined. About 47,000 more people died, from Thailand to Tanzania, when the tsunami struck without warning.